I never thought I'd see the day where a Bounty Bar, Dairy Milk or bag of Maltesers wouldn't tempt me. But over the last couple of years I've talked myself out of succumbing to those coloured wrappers vying for my attention at the corner shop. My eyes now glaze over and they hardly register. All that fat, sugar, calories! And virtually devoid of nutrition. What's the point! Besides, there are so many better, healthier options when it comes to buying chocolate. For example, OMBARs. OMBAR's have been around for a while. You'll commonly find them in health food shops. They're more expensive compared with regular chocolate, but at least you are paying for something which may provide some health benefits. 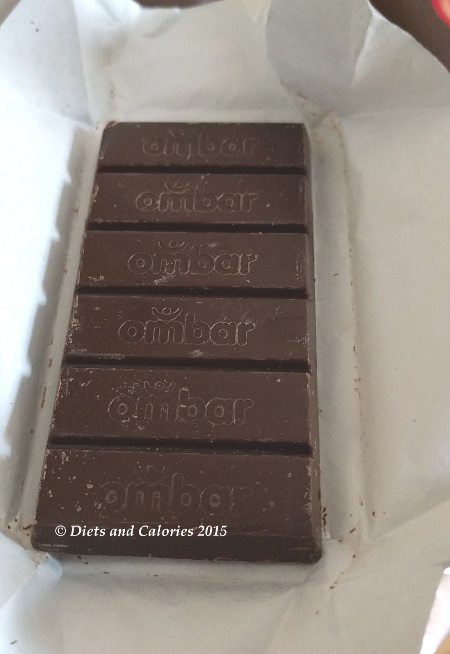 OMBARs are made from organic raw cacao which in itself is one of the richest sources of flavonoids. Flavonoids have numerous beneficial biological activities including helping prevent conditions such as cardiovascular disease and cancer. The trouble is, cacao is bitter to taste. So chocolate makers have to sweeten them up, usually with sugar. But, because they are quite strong in taste, any chocolate craving is usually satisfied after one or two squares. I keep mine in the fridge and break off a piece when I need a quick chocolate fix. OMBAR is available in nine varieties: Cranberry & Mandarin, Acai & Blueberry, Coco Mylk, Coconut 60%, Lemon & Green Tea, Strawberry Mylk; Goji Berry, Raw Cacao 90% and Raw Cacao 72%. What makes OMBAR so special? 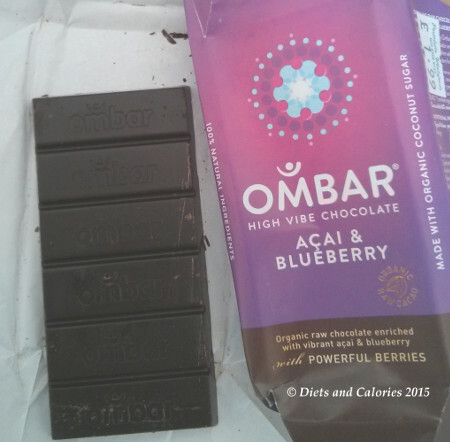 “Made with raw, organic Ecuadorian cacao, unrefined coconut sugar and real juicy fruits, every Ombar is packed full of goodness and deliciousness. We don't use gluten, dairy or refined sugar in our bars and keeping the cacao raw helps to preserve the naturally occurring antioxidants and flavanols, which help you to feel good." I tried the Coconut first. This contains 60% raw cacao which is quite dark. Regular milk chocolate is around 20-30% chocolate. The coconut flavour is lovely. The taste comes from the raw coconut cream in the ingredients. It also contains live bio cultures – great for boosting those gut bacteria. The Acai & Blueberry bar also contains 60% raw cacao with further antioxidants provided by dried blueberry powder and freeze-dried acai powder (this is very expensive to buy in health shops)! I love this flavour too. You can really taste the berries, though you can't see them as they're included in powder form. OMBAR 35g bars have 6 pieces, each worth around 35 calories. Larger bars are available. The small 35g bars cost me £1.99 each but prices do vary depending on where you buy them. Nutrition information per 35g bar: OMBAR Coconut: 202 calories, 15g fat, 9.9g saturates, 16g carbohydrates, 11g sugars, 2.9g protein, 0g salt. Nutrition information per 35g bar: OMBAR Acai & Blueberry: 204 calories, 15g fat, 9.2g saturates, 16g carbohydrates, 9.9g sugars, 2.6g protein, 0g salt. Ingredients OMBAR Acai & Blueberry: Organic raw cacao mass, coconut sugar, cacao butter, freeze dried blueberry powder (6.5%), freeze dried acai powder (0.4%).